We know with certainty that the majority of Scouts do like pioneering, and the better they get at it, the more they like it. So, if the Scouts have the desire, why aren’t more Scout units providing the remarkable fun that goes hand in hand with building and enjoying a wide range of pioneering structures? STUMBLING BLOCK 1: Nothing Succeeds Like Success! Generally speaking, experiencing failure is not great for sparking enthusiasm and rarely results in an exclamation like, “Hey! That was fun!” In his book Pioneering Projects, Gilwell Camp Chief, John Thurman wrote, “if any Patrol, Troop, or Scouter tries to start pioneering before establishing a sound background of basic Scout training in regard to knotting and lashing, then pioneering will become unpopular and will go down in the history of the Patrol or Troop as a failure.” Why? Because without the prerequisite skills, the structure won’t work or stay standing. That’s no way to equate pioneering with something the boys can successfully accomplish, and that’s no fun. But, just teaching Scouts the ropes is not enough! Unless the training sessions on knotting and lashing are “tied” to some fun or practical application, then repeated knot-tying and lashing sessions will be a source of exasperation and boredom—an inevitable turn off. Not good! 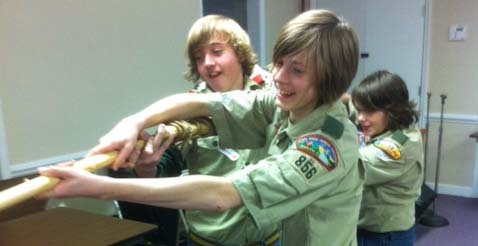 After introducing some basics, give the Scouts a real opportunity to put them into action! Not with an elaborate project, but with a challenge or game where they actually get to use what they learned. Now, if the youth and adults are really interested, what else will hold a troop back from implementing an effective Pioneering program? STUMBLING BLOCK 2: Lack of Scouter Training. (a) It’s possible the Scouters themselves don’t possess the necessary knowledge and skills required to introduce their Scouts to the knotting and lashing techniques required to construct even a simple camp gadget, not to mention a bridge. (b) Perhaps the Scouters never actually built the pioneering projects themselves, resulting in a natural hesitation to embark on ventures into unfamiliar territory. When there’s a desire to get into pioneering, but there is very little or no pioneering experience, the best training by far is from qualified individuals who have presented a well-rounded pioneering program to their units and have themselves helped provide the opportunities to successfully build the projects. In lieu of that, a great place to start is to get information that is both understandable and dependable. 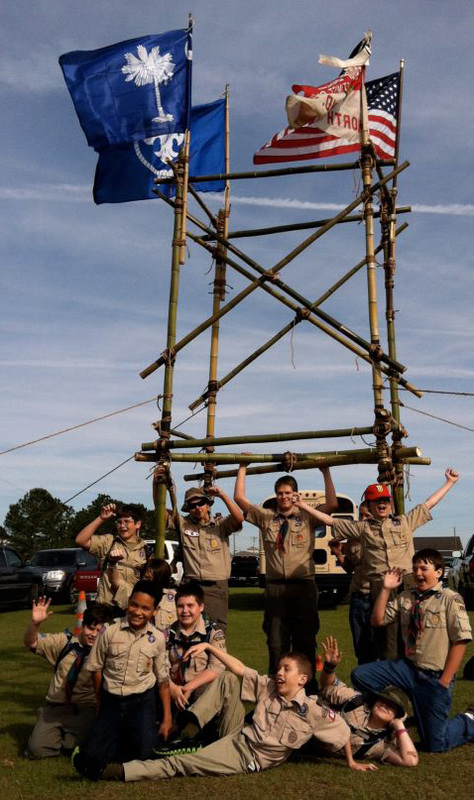 Successful pioneering programs have been developed from scratch by utilizing the 1993, 1998 edition of the Pioneering Merit Badge Pamphlet by Adolph Peschke. The pamphlet is like an A to Z primer on the modus operandi of basic pioneering. STUMBLING BLOCK 3: Lack of equipment. Lack of equipment is easily the most understandable of all deterrents. Naturally, when there are limited or even zero materials, implementing a unit pioneering program can be daunting proposition. For smaller camp gadgets you can use sticks, Scout staves and binder twine. But, for larger projects, you need the right kind of lashing ropes and the right kinds of spars. 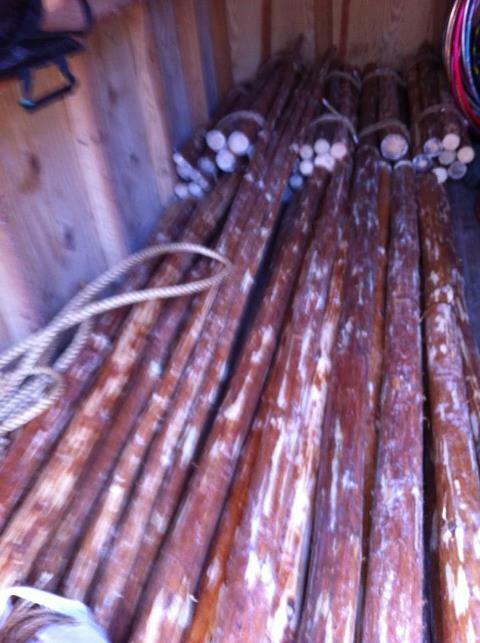 A collection of pine spars ready for transport to the unit’s storage facility. 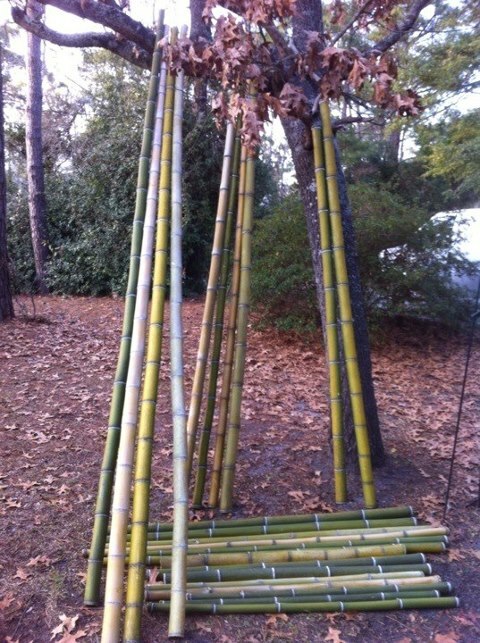 A collection of bamboo, in the quantity and size to build the chosen project. Make an ongoing and concerted effort to get everyone on deck to help locate and gather the materials needed to build the targeted project(s). This is a whole lot easier and more practical than when one individual takes on the responsibility all by himself. Start with what you need. Expand as you go. Necessity is the mother of invention. Gather the materials you need based on where you are in the cumulative pioneering process. Start with what’s necessary for training and interpatrol activities, and then add the components required for a chosen project, starting from the more simple, e.g. a Double A-frame Monkey Bridge. That way, you can start building your pioneering program around the specific project you’ve got in your sights. If you’re in an area that just ain’t got no trees, check into building a pioneering kit made up of laminated spars. Nothing really worth doing is ever really easy. The keys are a willingness to learn, a desire strong enough to motivate you to persevere, and the sound conviction that: this is going to be great!